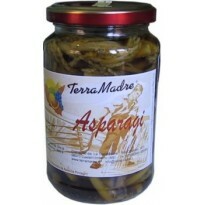 Asparagus is particularly appreciated for its fleshy and firm texture. Its sweet and sour flavour and delicate aroma make them unique. Preserved in Extra Virgin Olive Oil. Suggestion: taste them stir-fried in a pan with coarse salt or add them to your favourite salad.